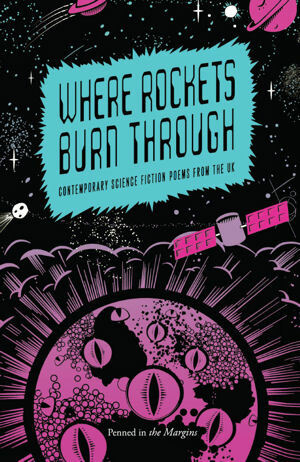 Just a wee note to flag up a review of Where Rockets Burn Through at Amazing Stories: HERE. The reviewer, Diane Severson, also included some ‘show notes’ at her blog. In the review, Diane briefly describes the structure of Where Rockets Burn Through, edited by Russell Jones and reviews Russell’s chapbook of SF Poetry Spaces of Their Own. There are a fair few audio readings in the review, mostly short poetry, as well as short glosses of some of the poems from the collection. I also submitted some audio for my poem, The Costume, which you can go and listen to if you fancy it. I’m obviously a bit mortified at my own recorded voice – but glad for the opportunity to promote poetry! As ever, you can order Where Rockets Burn Through online! (£9.99, 208pp, Ed. Russell Jones). But definitely go have a look and listen of the review if you have a chance. Some poetry news! Have just received my contributor copy of UNIVERSE II: Techno Animism, which kindly includes my poem, The Costume. The Costume was first published in the amazing sci-fi anthology, Where Rockets Burn Through, which just had its first birthday a few weeks back, I do believe! Universe is an arts and science-fiction writing magazine, and the issue my poem features in is full of really lovely full-colour art pieces. I imagine I’ll be hanging the spreads up on the wall after posting this! Or order Where Rockets Burn Through online! (£9.99, 208pp, Ed. Russell Jones).